This product is a fanless computer for embedded applications. It features an Intel Atom processor E3845 chipset. Thanks to a quad-core CPU, simultaneous stable high-speed processing for four applications is possible with four cores. This CPU also allows for computing power almost four times that of conventional products in addition to three times the graphics performance, a significant improvement. It adopts the low-power platform with Intel? AtomTM Processor E3845 that realizes lower power consumption while ensuring sufficient performance. This product, as in our other products, is designed to comply with the safety standard of VCCI, FCC, CE, and furthermore, its safety has been certified to meet the UL standard for Europe and the U.S. Supports system startup by external device over network (Wake-on-LAN), by general purpose input (power on by GPI), and by modem reception (power on by ring). It encourages significant labor saving in operation. 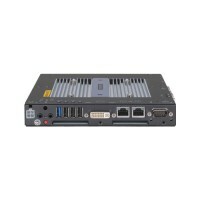 It has a variety of extended interface such as DVI-I x 1, 1000BASE-T x 2, USB3.0 x 1, USB2.0 x 5, serial (RS-232C) x 2, DIO x 1. As the product supports a wide range of power (10.8 - 31.2VDC), it can be used in a variety of power environments. The separately available AC adapter adds support for 100 - 240VAC power.